MTV is launching a documentary unit called MTV Docs, and the network’s first one-hour documentary will see Macklemore interviewing President Obama in Prescription for Change: Ending America’s Opioid Crisis. The show, which will feature President Obama and the Seattle-based singer sharing personal stories about substance abuse, is set to premiere worldwide at the White House on Tuesday and on MTV next Tuesday at 9 p.m.
“I’m one of millions of Americans who has struggled with addiction and abused pain killers, and if it weren’t for treatment and recovery I wouldn’t be here today,” Macklemore said in the statement. The Prescription for Change world premiere coincides with the White House’s “South by South Lawn” festival, which held its Leonardo DiCaprio-hosted climate change event on Monday. MTV News’ senior political correspondent Ana Marie Cox is also expected to moderate a discussion with Macklemore and National Drug Control Policy director Michael Botticelli. 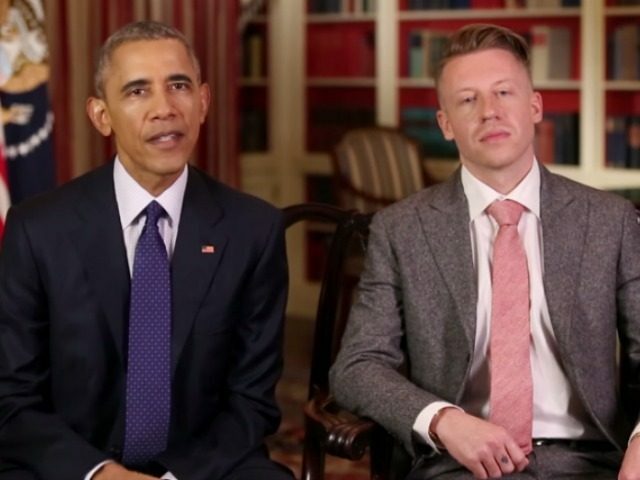 The release of MTV’s new documentary marks the second time that Macklemore and Obama have teamed up to tackle drug abuse in America. Along with Prescription for Change, MTV Docs is prepping two more documentaries this year: Transformation, which will cover transgender youth in Los Angeles and a film that will chronicle electronic music band Major Lazer’s historic concert in Cuba earlier this year. October is a busy month for Macklemore. He and his producing partner, Ryan Lewis, will be speakers at a private political fundraiser in Seattle, where Democratic presidential nominee Hillary Clinton is expected to attend. Tickets for the October 14 event range from $250 to $27,000.